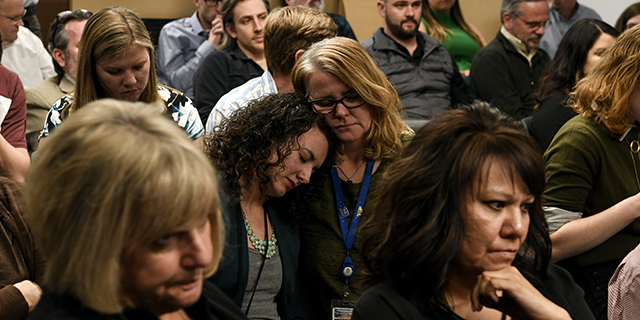 The analysis comes amid a series of highly publicized staff reductions by hedge fund companies that had acquired well-known newspapers, including The Denver Post, where employees publicly criticized the cuts made by the papers’ owners. To reach these estimates, the Center searched for and examined news articles that cited staff layoffs at 110 newspapers and 35 digital-native news outlets. Using these sources, the study tallied layoffs at daily newspapers with total Sunday circulations of at least 50,000 in the fourth quarter of 2017 (as measured by the Alliance for Audited Media), as well as The Wall Street Journal, which has no Sunday edition. Layoffs were also tallied for digital-native news outlets with a monthly average of at least 10 million unique visitors during the same period, as identified in the Center’s annual research on the state of the news media for the digital news sector. The news articles examined did not always mention the kinds of positions eliminated, so the layoffs analyzed here were not necessarily of newsroom employees. 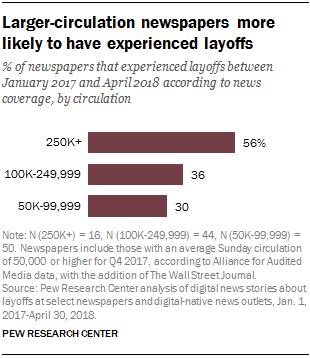 Of the 110 daily newspapers in the analysis, 40 – or 36% – were found to have gone through publicly reported layoffs during the 16-month study period, with at least 12 experiencing more than one round of layoffs. It is possible that even more occurred but remained under the radar of the search methods employed in this analysis. The prevalence of layoffs at newspapers in the analysis during the 16-month study period reflects recent employment trends in the newspaper sector, according to the Bureau of Labor Statistics. Between 2014 and 2017, the number of newspaper newsroom employees dropped by 15%, from about 46,000 to about 39,000. 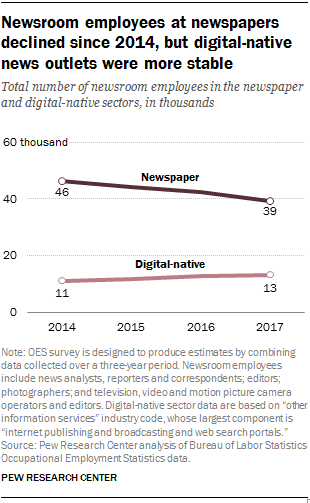 There was no significant change in digital-native newsroom employees, however, as the number remained around 11,000 to 13,000 over the same three-year period. 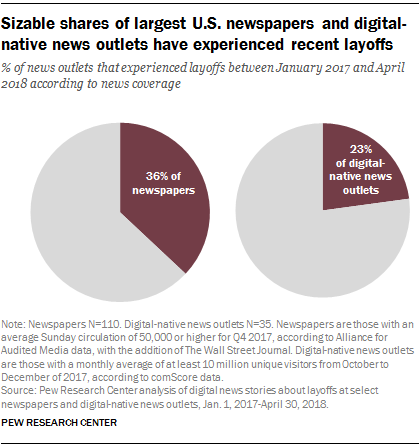 Layoffs at digital-native news outlets, in other words, may have been offset by hiring at other outlets, which was not part of this analysis.